CHICAGO (WLS) -- After years of support for Pilsen Neighbors Community Council, and participation at Fiesta del Sol, ABC 7 Chicago will be a sponsor of this four day festival for the second consecutive year. ABC 7 Chicago Eyewitness News members Stacey Baca, Ben Bradley, Terrell Brown, Michelle Gallardo, John Garcia, Leah Hope, Judy Hsu, Roz Varon, Jim Rose and Linda Yu will be greeting people at the ABC 7 booth on Saturday, August 1 and Sunday, August 2 between 11 am and 4 pm. The ABC 7 booth is located on the corner of Cermak Road and Racine. This family friendly event, July 30 - August 2, 2015, draws over 1 million visitors. 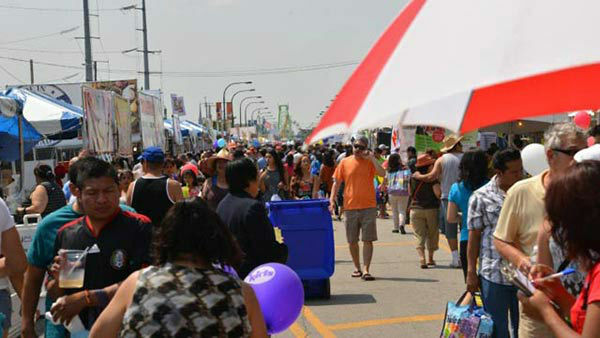 Billed as the largest festival in the Midwest, Fiesta del Sol is brimming with live entertainment, local art, a variety of delicious food, carnival rides, a children's area, soccer games and educational resources for parents and youth. This festival is organized by the Pilsen Neighbors Community Council, a non-profit organization celebrating 60 years of service to the community. Organizers of the festival say, "We organize Fiesta del Sol each year because it promotes the Pilsen community, provides scholarships to local youth and helps generate revenue to support work in education reform, immigrant advocacy, workforce development and more."